hellomagazine.com The American couple had a busy day on May 24 meeting the Belgian monarchs and pope. President Donald Trump and First Lady Melania Trump were treated to a royal reception on Wednesday, 24 May. King Philippe and Queen Mathilde of Belgium welcomed the American couple to the royal palace in Brussels. The monarchs and the Trumps were all smiles as they posed for photos beneath ornate chandeliers at the palace. The royal family’s Twitter account tweeted photos from the meeting writing, "Welcoming @POTUS Donald Trump and @FLOTUS Melania Trump at the Royal Palace of #Brussels #Belgium." Melania looked characteristically chic for her audience with the Belgian royals wearing a gingham wool-jacquard coat by Michael Kors, which she accessorised with matching Manolo Blank pumps. Meanwhile, Mathilde exuded femininity in a dusty pale pink dress that featured floral designs. The foursome appeared to be in great spirits as they conversed. Barron Trump's mother was photographed talking with the King, while her husband chatted with Queen Mathilde. Surely there was no language barrier between the first lady and the monarchs. Melania speaks multiple languages including German and French, which are two of Belgium's there official languages. Following the president and first lady's visit with the royals, the palace posted a behind-the-scenes photo of the stylish women enjoying a conversation across from their respective spouses in one of the palace's rooms. Melania and Donald are currently on the fourth leg of their foreign tour of the Middle East and Europe and will stay in Belgium for two days for the NATO summit. The couple journeyed from Italy to Brussels on 24 May after having an audience with Pope Francis at the Vatican earlier in the day. While at the Apostolic Palace, His Holiness and the first lady joked about the president's diet. "What do you give him to eat? Potizza?" the pope asked Melania, to which she replied, "Yes!" (Potizza is a dessert served in Melania's native Slovenia). Melania continued to uphold her status as a style icon donning a black lace coat dress by Dolce & Gabbana and matching black veil for the occasion. Aside from meeting royals and the pope on Wednesday, the former model also paid a visit to the Bambino Gesù Children's Hospital in Rome where she met a number of young patients and spoke to them in their native language. "She spoke to them in Italian, she signed bandages, and she took lots of selfies!" Stephanie Grisham, Melania's press secretary said (via USA Today). "She personally wrote a letter to the pope asking to go. Princess Diana and Mother Teresa have both visited as well." Before leaving the hospital, which was "very emotional," the first lady penned a note in a guest book that read: "Great visiting you! Stay strong and positive! Much love, Melania Trump." 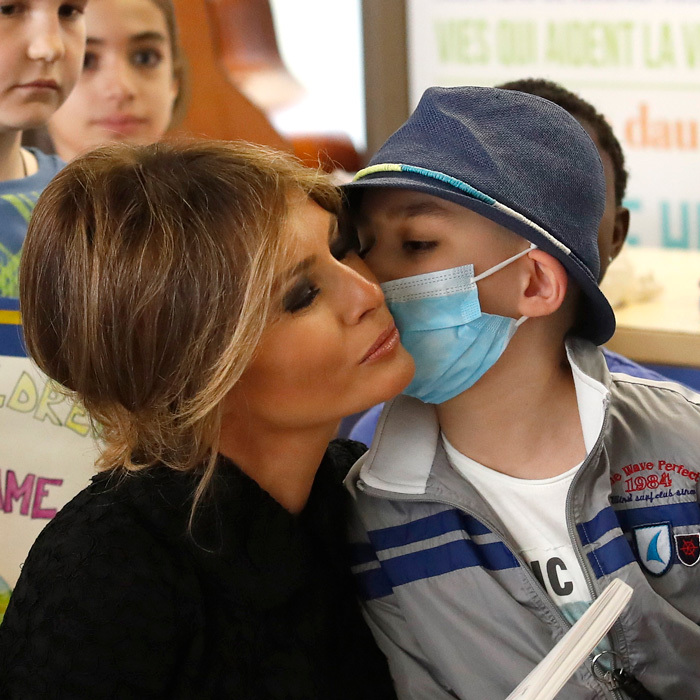 Clearly moved by the outing, the 47-year-old took to social media to share a photo of herself surrounded by children during her visit, which she captioned, "Thank you @bambinogesu for the heroic work you do on behalf of your patients. I ask that everyone keep these amazing children in your thoughts & prayers."